HR 306 and HR 8938 Cep (HR 306 Cephei and HR 8938 Cephei), a two- for-one polar special. These two north polar stars, both in Cepheus (but closer to Ursa Minor than to the King's classic figure), highlight several issues: first "selection," in which nature shows you what she wants; second that the sky is not in two dimensions, but in three; third that age and mass are crucial in stellar life; fourth that measurement errors are always with us. While the vast majority of stars are dim-bulb class M red dwarfs, the constellations are made of intrinsically luminous, though rather rare, stars. Nearly all the stars in these pages are more luminous, many much more, than the Sun. They have to be, otherwise you would not see them. 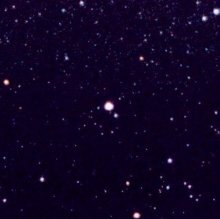 NO red dwarf is visible to the naked eye. A look through all the polar stars, those here within a six-degree-wide box around Polaris, shows the same thing. While at least this set is objective (that is, not selected by whimsy), all are (in total power) still brighter than the Sun. The telescope reveals a very different world of much weaker stars. We also think of stars as plastered on the 2-D screen of the sky. But they are in 3-D. What does the sky look like from another star? Polaris (the jewel in a small semicircle of faint telescopic stars called the "Engagement Ring") is centered in a six-degree-wide field of view that shows a variety of other "polar stars." HR 306 and HR 8938 are the two brighter stars about halfway between Polaris and the lower right corner, HR 306 the one on the left. Lamdba Ursae Minoris is the reddish star up and to the right of Polaris, while Yildun (Delta UMi) is the brighter of the two stars at the upper right corner. Roughly between Lambda and Polaris lies the North Celestial Pole, around which they all seem to revolve. See the full-resolution image and more on polar stars in the Polar Project. HR 306 (the name from the "Bright Star Catalogue") is a sixth magnitude (6.25) class K (K2) giant 326 light years away that has precious little known about it. Estimating the temperature at 4450 Kelvin (to get the amount of infrared light) leads to a luminosity of 45 times that of the Sun, a radius of 12 solar, and a low mass of one or two solar. Indeed, HR 306 is what our Sun may look like as it starts to die in five or six billion years. HR 8938 is a somewhat brighter, still-sixth magnitude (5.58), class A (A7) subgiant 307 light years off with an estimated temperature of 8000 Kelvin, a luminosity of 44 Suns, and radius of 3.5 solar. With a mass of 2 1/4 Suns it is (consistent with its subgiant status) giving up core hydrogen fusion, its age about 900 million years. The luminosities of the stars are remarkably alike: the K giant's is high because it is well into the death process, the A subgiant's because it is the more massive of the two. What would they look like if you could fly to either star? From the measures, they are only 20 light years apart. From either, the other would hardly hide out as they do from here: each would appear at magnitude zero, rather like Vega does to us. (From 8938, 306 would be at magnitude 0.21; from 306, 8938 would be at minus 0.32.) But each distance measure is afflicted with a five percent uncertainty. They could thus be at nearly the same distance and be much brighter in each others' skies. Much of the effort in astronomy is in lowering measurement errors to make the sky more precise -- and more knowable.